Want irresistible herbal tea recipe that takes only 10 minutes to prepare? Chamomile and lavender iced teas are ideal for summer, while nothing beats a romantic evening wover a cup of rose petal tea. Today, many people have a bad habit of grabbing a sugar-filled soda whenever they are thirsty. Herbal teas can provide a refreshing substitute that is much better for you! Chamomile has an incredible flavor, like apples with honey. This delicious iced version will help you stay cool no matter how hot it gets outside! Cook Time: 10 minutes, plus several hours to chill. Step 1. 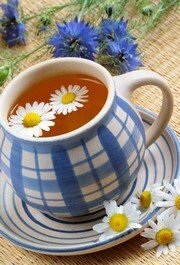 Bring the water to a boil in a large pot with the chamomile flowers. Step 2. Let the tea steep for 10 minutes, then remove the tea bags and add honey and vanilla. Sweeten to taste. Step 3. Let the tea chill for several hours, then transfer to a pitcher and keep in the fridge. For an elegant presentation, serve this in a tall glass with a sprig of mint to garnish! What could be more romantic than drinking rose petals? In this herbal tea recipe, the delicate flavor of rose petals is enhanced by spicy cinnamon and sweet orange. Delicious hot and refreshing cold, it is the perfect drink for an evening with that special someone. Step 1. Heat water to boiling. Step 2. Put the rose petals, chamomile and orange zest in your tea ball or tie them up in cheesecloth. Place the herbs in the cup along with the cinnamon stick. Step 3. Pour water over the herbs and steep for 5 minutes or to taste. Step 4. Sweeten with honey, if desired. 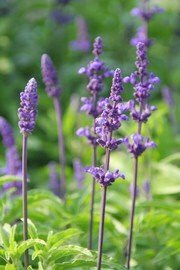 Many people don’t realize it, but lavender is edible. The flowers add a delicate, flowery perfume and an exquisite taste to this refreshing iced tea.